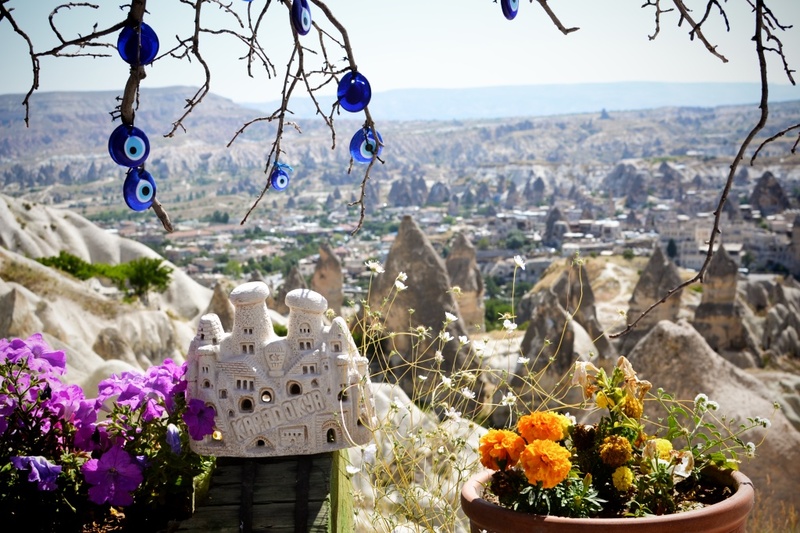 Cappadocia in Central Turkey is home to some of the strangest landscapes on this planet! 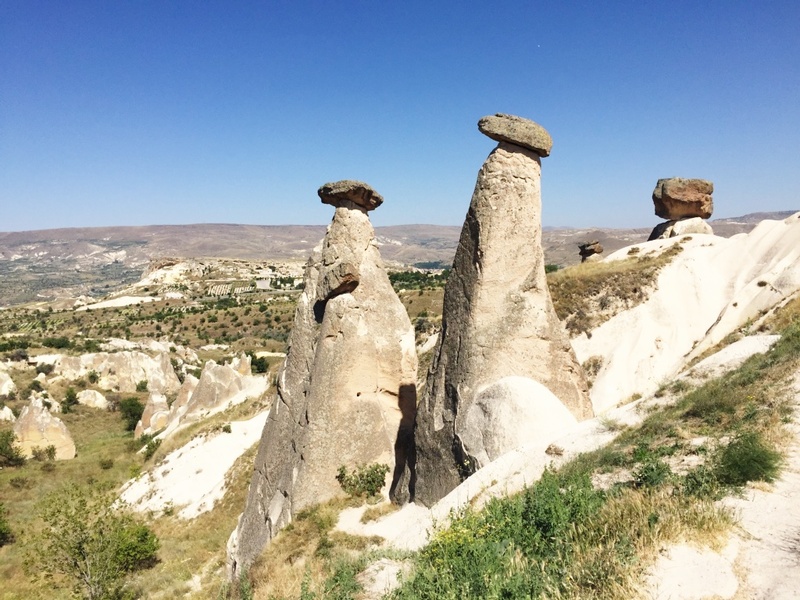 Many travellers compare it to a lunar moonscape because of the arid geography and volcanic rock formations that have eroded over time – creating fairy chimneys! Early inhabitants thought fairies lived in these unique structures. 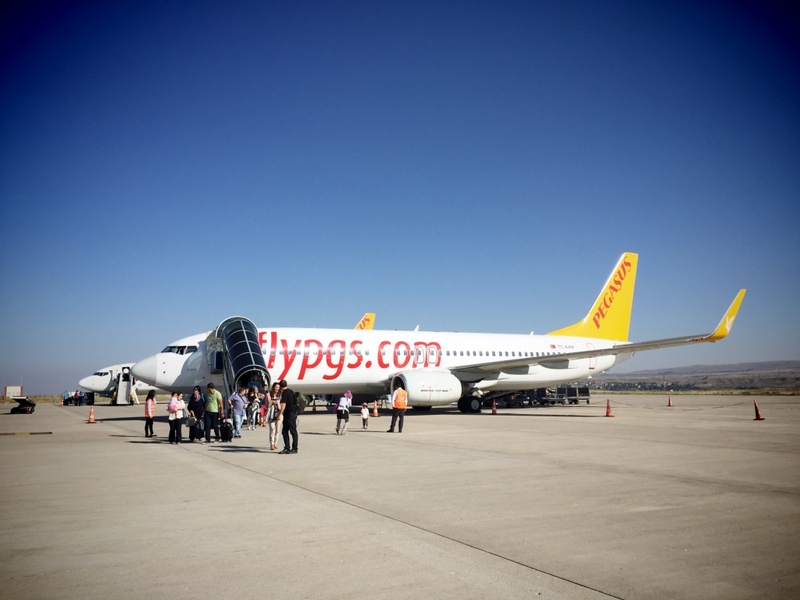 I caught an early morning flight from Istanbul using Pegasus airlines and had a quick flight into the Kayseri Airport. Our luggage arrived right after we got into the terminal and there was a driver outside the entrance holding a sign with my name on it. He wore a pegasus airline polo and carried a list of passenger names. A couple from the US stood beside us and he offered (sold?) them a ride in the van as well, last minute! Alison and I climbed into the first row of seats and had the best view of our new surroundings. 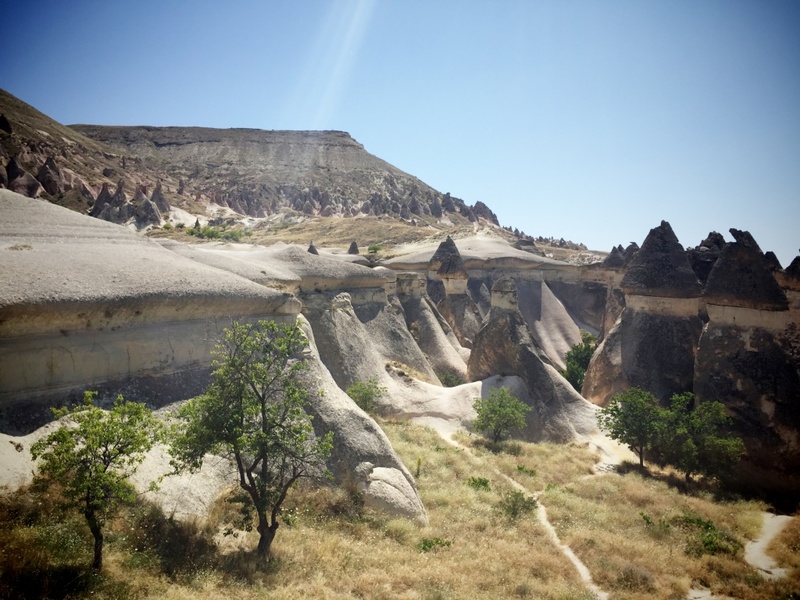 I peered over the edge of the van and saw some small canyons with their distinguishable chimney formations! Although we were in a dessert region, we passed some green fields which I believe were wineries. As we drove past some towns, I asked Alison if the concrete scenery reminded her of any other city, because to me, I felt like I had seen similar construction buildings in China! Once we actually drove through one of the towns though, the geography turned very different and looked very old! 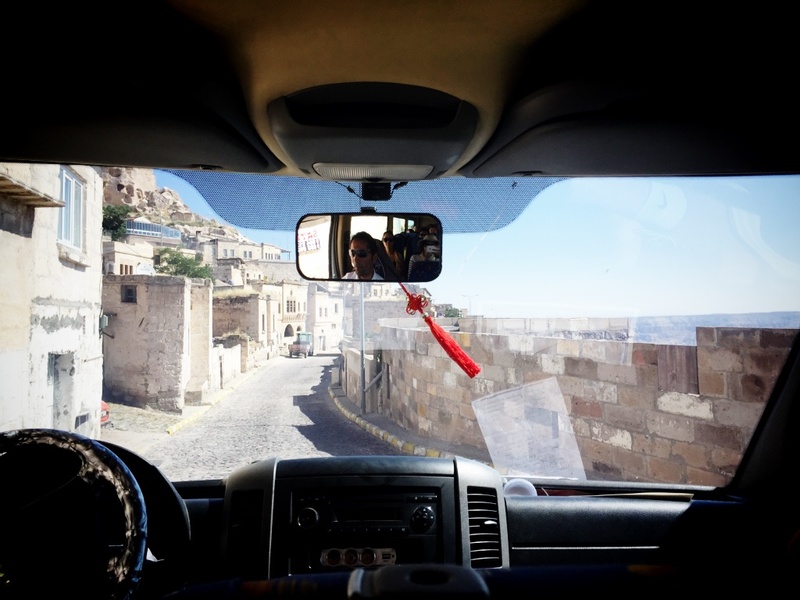 The narrow roads had many twists and turns and our driver was crazy for backing up next to some steep edges! In the photo above, at least there is a walled barrier, but in other places the cliffs were right there with our vehicle driving dangerously close! A boy at the back, probably around about 4 years old, asked if we were going to die (in a joking way!?). The van dropped off a couple at their hotel, and then we disembarked at a view-point/rest area to meet our tour group for the day! Here, we moved our luggage into a new van and joined our group of 12 people. I thought that we would have a chance to leave the luggage at our accommodations, and also change into a new set of clothes, but nope! We went straight into touring. This meant that I would end up wearing the same elephant pants from the previous days. That’s OK, these elephant pants from my travels in Cambodia are made for travel and fantastic for hot weather! I’m a meticulous packer and brought several hats – including this canvas trekking hat with an SPF of 100! Well, that’s what I told Alison when proudly showing off my new accessory (in reality it’s SPF 50 – thanks Sis for the hat! We purchased it while I was visiting her in Las Vegas where we did a bunch of “local” activities such as Costco shopping ). Alison wasn’t as enthusiastic about this practical, yet fashionable piece of attire and labelled it my “walking birth control”. While marveling at our new surroundings we encountered a few hazard warning signs, but that didn’t stop us from taking some photos near the edge. Towns were carved in and around this valley. 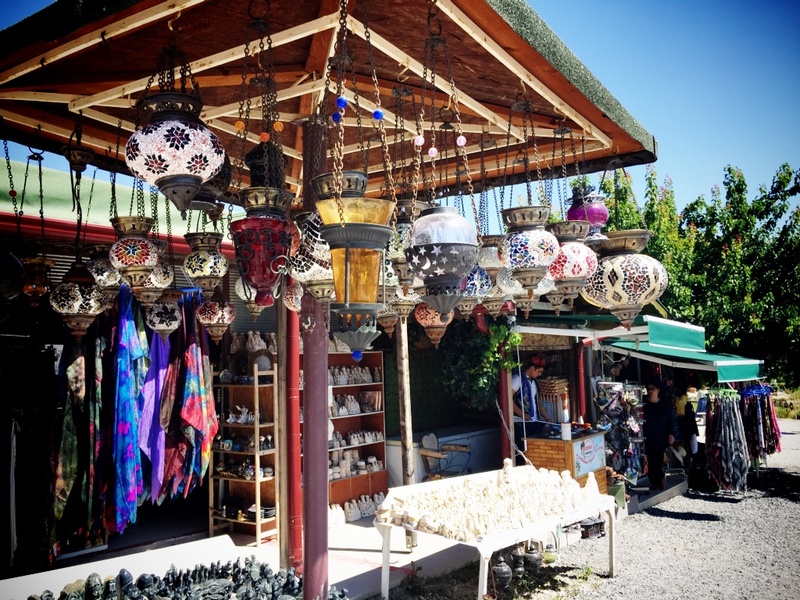 Here’s a piece of shopping advice: a simple and economical souvenir to purchase that’s very Turkish is the evil-eye, which is a symbol used to ward off evil. I received several of these talisman as “gifts” from various vendors and merchants. And so, we got to try lemon, berry, chocolate and vanilla flavours. The texture was smooth but sticky, and it didn’t melt as quickly! What makes ice cream here unique is that it is created from goat’s milk. Just before our tour bus left, I made a quick stop at the washrooms. Most public places charged 1 Turkish lira for the WC facilties so definitely carry some change on you. 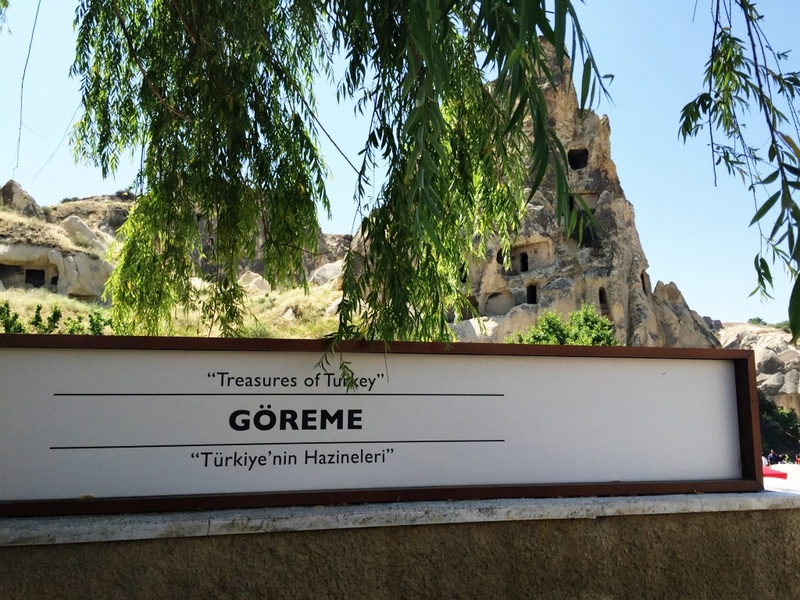 The jewel of Cappadocia – one of the best preserved open air museums is called Göreme! People created homes and churches here hundreds of years ago and left behind traces of their way of living. We got to see remnants of the previous inhabitants while walking through these old cave homes, including creepy skeleton graves! 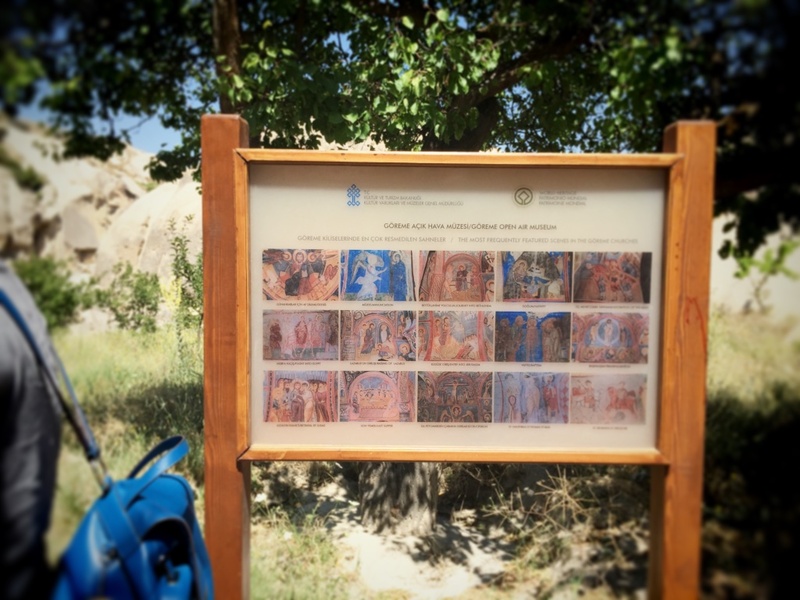 The walls were adorned with colourful paintings in varying detail and artistic ability (some of the walls looked like the scribbles of a 3 year old), and photography is banned to help preserve the collection of paintings. 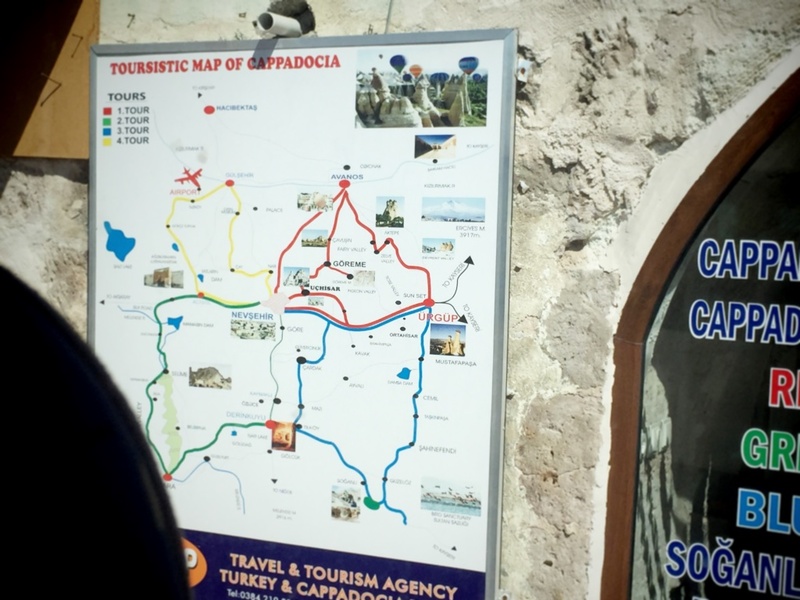 This sign below summarizes the many frescoes one would see inside. 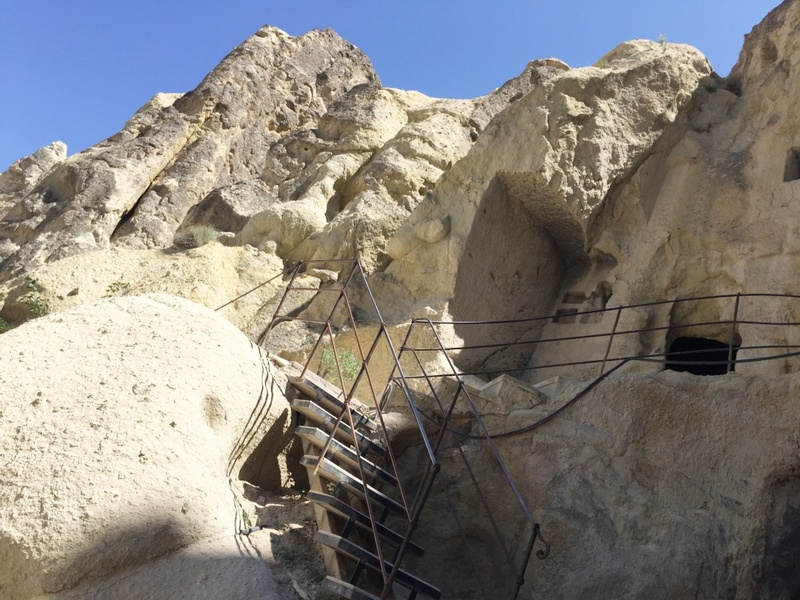 We used our free time to climb into additional cave dwellings. 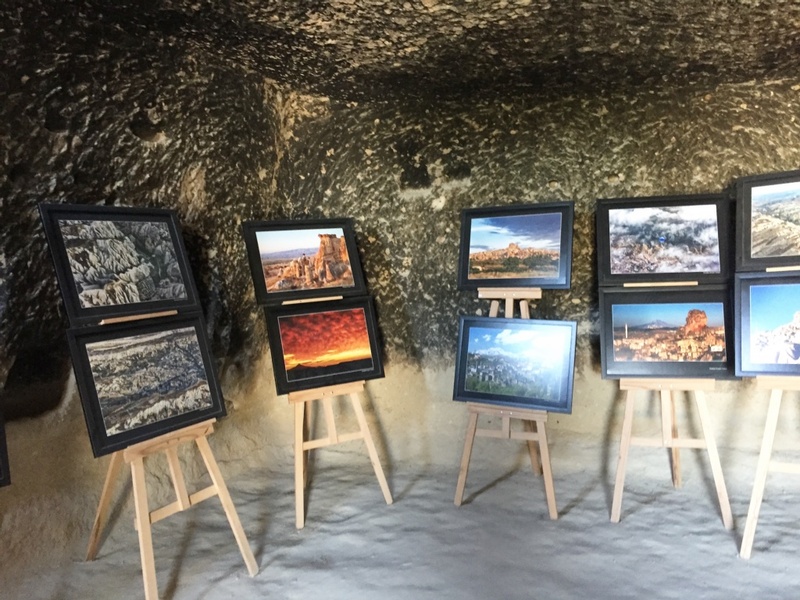 Modern day art gallery – I got to appreciate these stunning photos of the region while cooling down in the cave. Taking a break to admire the landscape. This was our tour guide! She would stop in front of important structures to give us some background history and then let us go off to have free time for exploration and photos! I appreciated that our tour group and size allowed us to roam around rather than be herded from one site to the next. At the end of our visit to this open air museum, Alison got the first ice cream bar (magnum brand) of our trip! 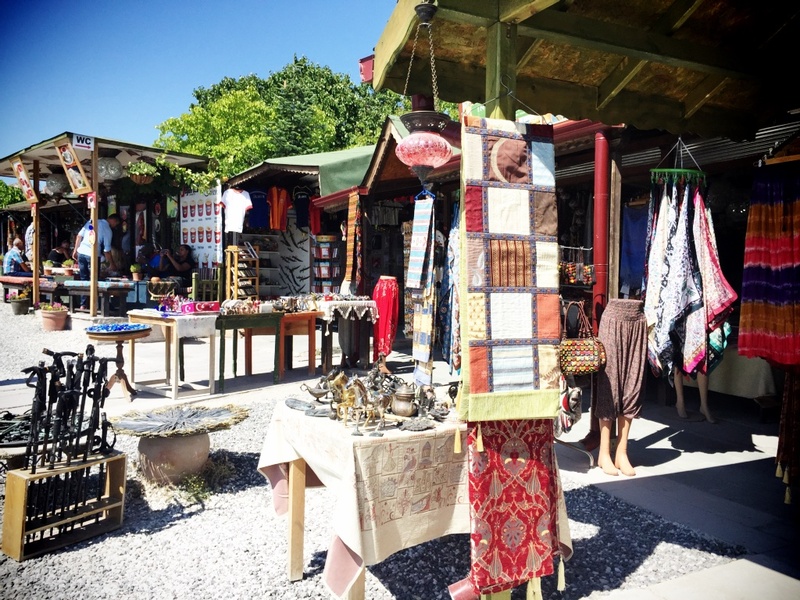 5 Turkish Lira – not bad for a tourist joint. Next stop was our lunch buffet. The restaurant was called Han, which was the same name of the restaurant we went to on the previous day’s lunch! We wondered if there was a pattern here. The lunch spread included lots of chicken, meat and fish as well as an ample vegetable and salad bar. We even had some dessert (cream puffs) and baklava, although the kind here couldn’t even come close to the quality we had in Istanbul (where I went back to the same place 3 days in a row!). The highlight of lunch wasn’t the food then, it was connecting with other travellers! 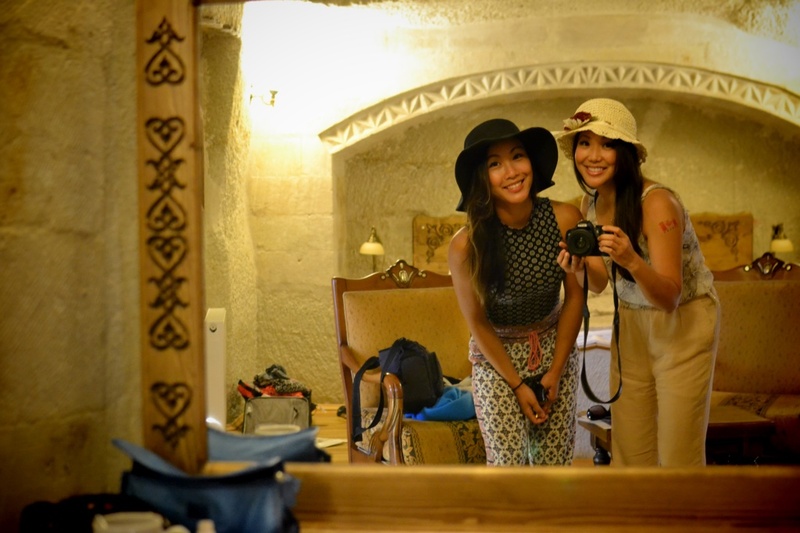 Two of the girls on the trip were from China and I had a wonderful time talking to them about their studies abroad in Europe and life back home. We added each other immediately on the Chinese messaging app – WeChat. This was the very same app I was using to stay in touch with Eric while he was in Beijing. The girls and I have stayed in touch and I might even meet up with Wendy when I return to Hong Kong. 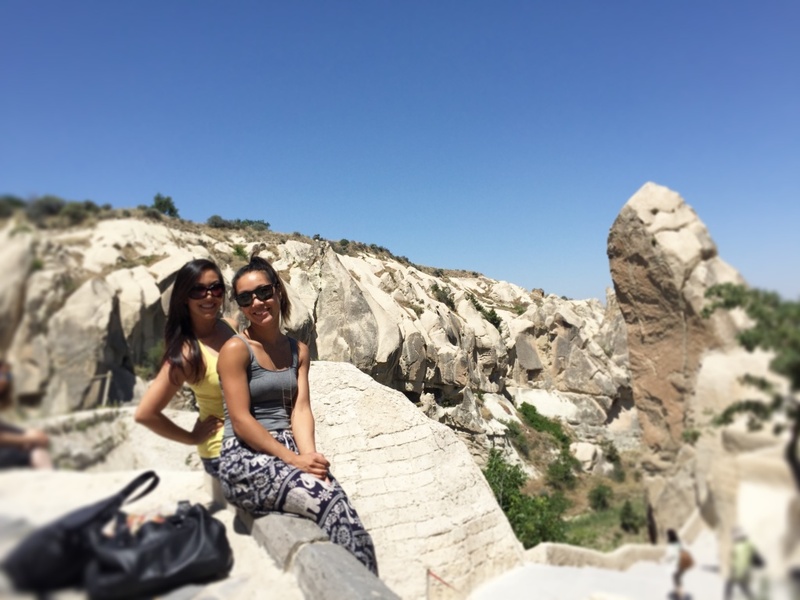 Alison sat next to a woman from London, Ontario who had gone to Turkey 10 years ago to get married! Now, she was showing her cousin from North Vancouver around the country. Again, what a small world to meet another Vancouverite! Cappadocia has excellent soil for pottery so following lunch we stopped at a local business to watch a live demonstration. 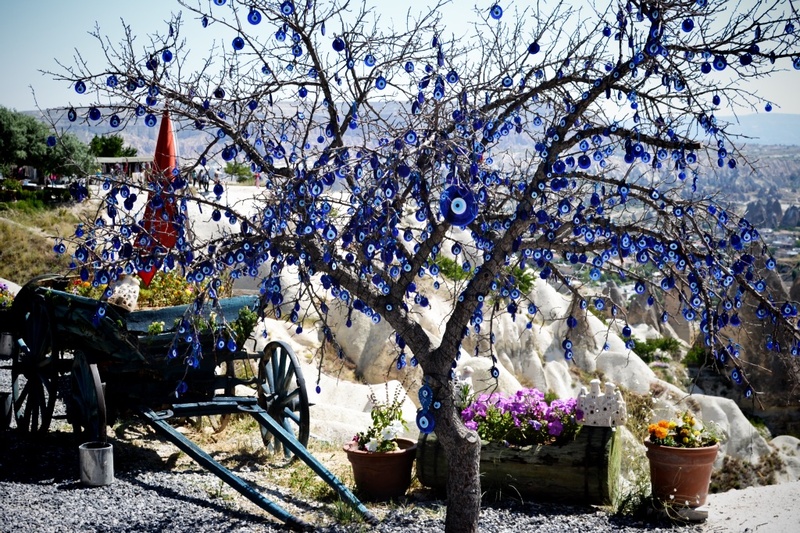 This was pretty mesmerizing and I didn’t feel that the tour company or the shop owners were being pushy in their sales. It was a fun way to see a local artisan in action, have a break from the heat, and also get some apple tea in the process! 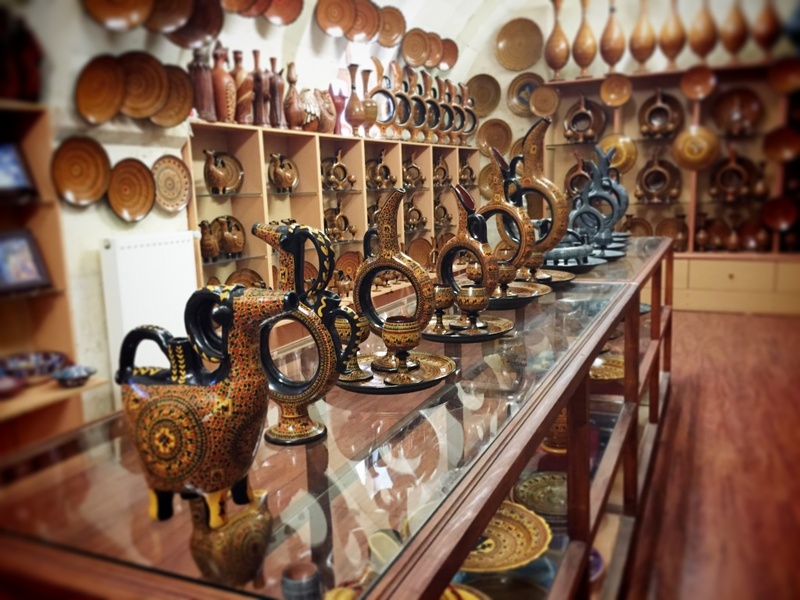 The animal-shaped vases were especially cool and beautiful – you could pick pone up and rest it on your shoulders. These act as wine carriers. 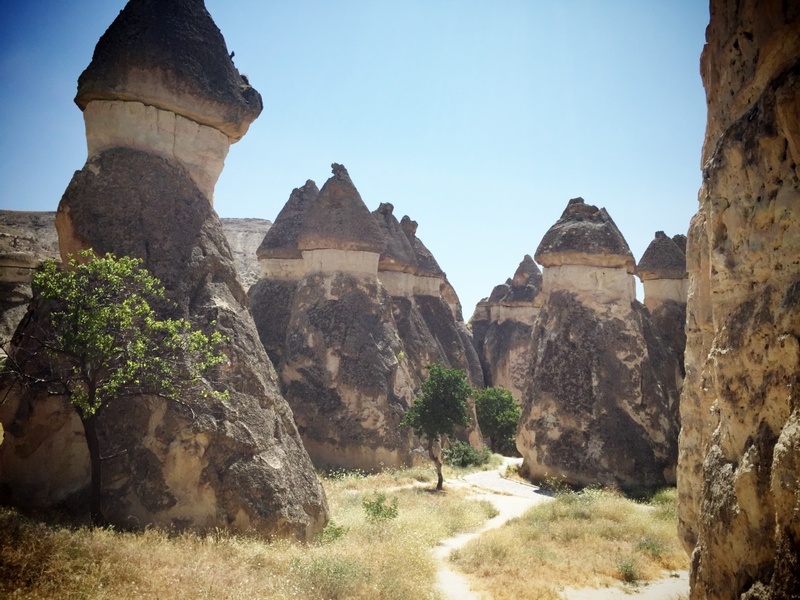 I loved our next tour stop – walking through the Fairy Chimneys! These structures were out of this world with their mushroom-capped tops – they would fit right in with a fantasy movie set like Avatar or Star Wars! We had a good 45 minutes here to wander through the valley crevices and even hike around. I scrambled up a dusty path (don’t recommend doing this in Tom shoes!) and onto this ridge where a few others from our tour group were shooting videos of the surreal landscape below. 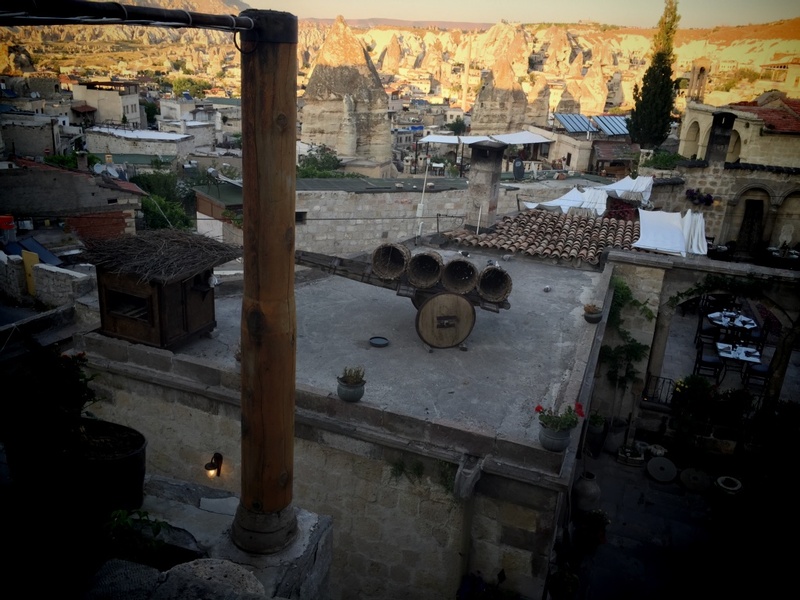 The best collection of fairy chimneys around. We took turns deciphering images ranging from a camel, a turkey and even Napolean’s hat! 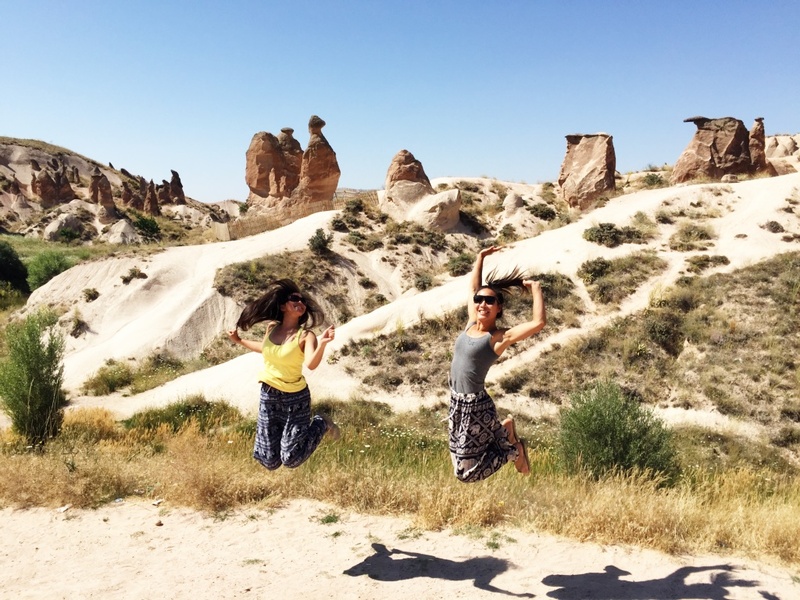 Then we shot these jumping photos, because one has to while traveling! And then of course, I had to pour a full bottle of cold water on my best friend because the weather was incredibly hot (and she did ask for it)! She got me back afterwards and a mini-water fight ensued. Water would be no match for my Canada Day tattoo though! I had been wearing that since my sunrise hike on Canada Day and it lasted through the whole month! Our final viewpoint of the day was in front of this family of disciples. It looks like they’re wearing funny hats. Continuing with the mushroom theme – they kind of resemble the enoki mushroom family. We wrapped up the day’s touring activities around 5:00 pm and went by everyones hotels to drop them off directly. I called our travel agent ahead of time to inform them of the special occasion – my best friend’s 30th birthday!! They upgraded us to one of their authentic cave rooms with a beautiful arch and domed ceiling. 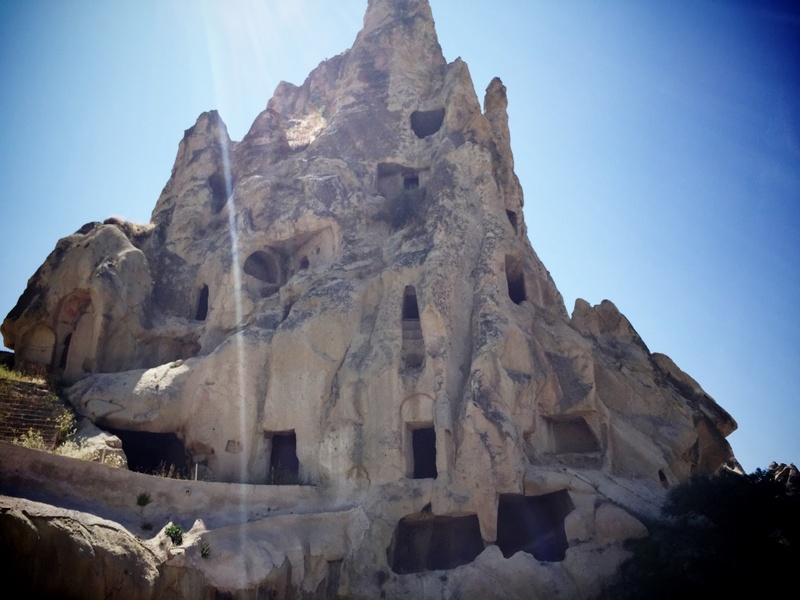 As always, I researched a lot of different options (planning and prep post here) and read that some cave hotels only offer a few rooms in the actual “cave” portion, and I knew it would be special to sleep in a legitimate cave, so this was the winner. 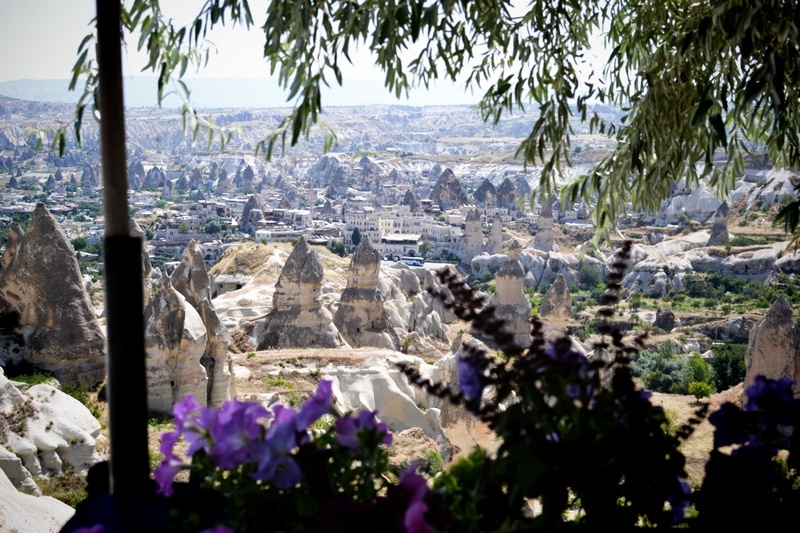 From our vantage point, we had spectacular views of the rose-coloured valleys below us. After a dusty day we finally took a shower, followed by photos of the room (will have to do a summary of this and Turkish accommodations as part of my hotels series later!). At night, we went next door to a highly recommended top-rated restaurant. 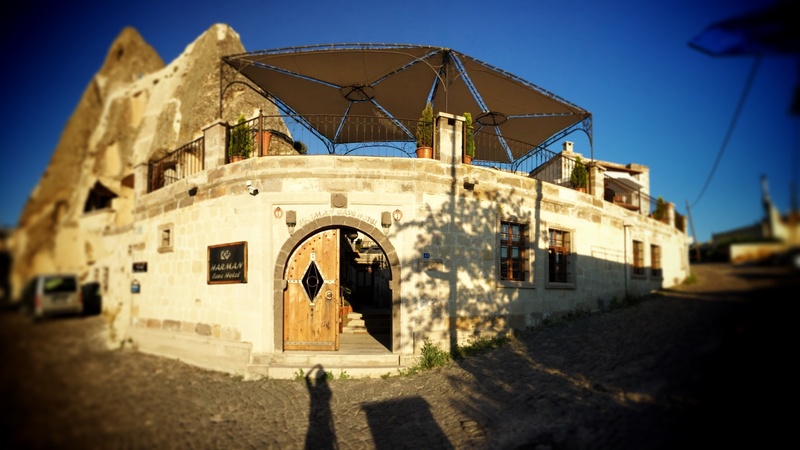 The restaurant was in a lovely location with beautiful surroundings depicting local artwork and architecture. However, the actual dining area was quite subterranean and I wanted us to enjoy the sunset glow before the light disappeared. The hotel manager suggested we relax with a drink on their terrace before descending to the restaurant for dinner. His name was Mustafa, which turns out, is just as common as the name Ahmet (Ahmet was our wonderful and charming guide in Istanbul). While sipping on apple tea (in a large cup!) Alison was mesmerized by this pigeon man on the deck below us trying to coerce the pigeons back into their pen. It was so relaxing to simply sit back and take our time. 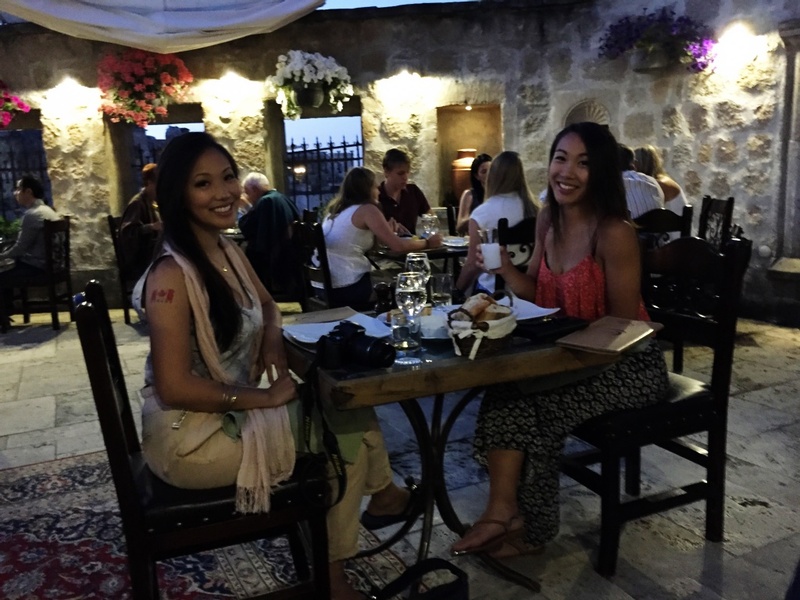 At dinner, we continued our adventure in exploring new Turkish cuisine. New for tonight – the national alcoholic beverage Raki. It had a pungent liquorish flavour. Our server admitted he didn’t care much for raki either. When it comes to national foods in Turkey, I shall stick with baklava! We did however, like the surprise complimentary blankets! 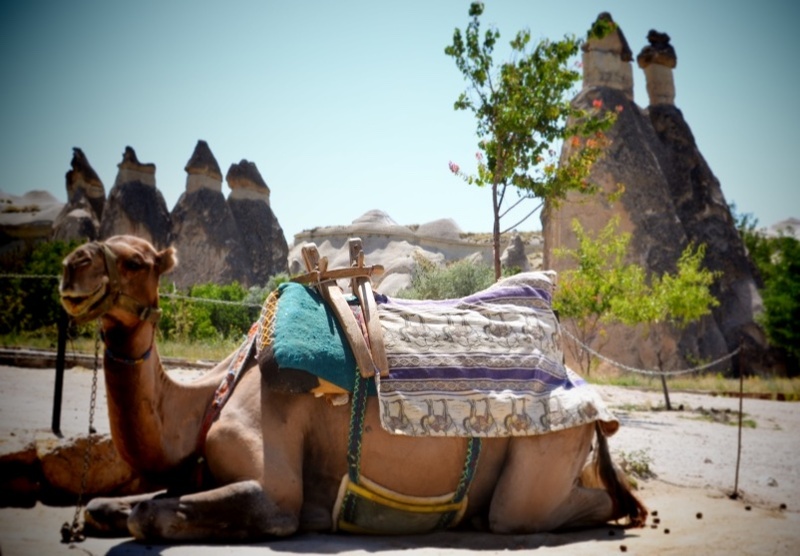 Cappadocia gets very hot during the day and then cools off in the nighttime. We were in a festive mood and ended up ordering way too much food! This was a puff pastry with meat and spinach. We also had two different kinds of cozy soup with lentils and meat, a salad and then a lamb dish wrapped in pita. 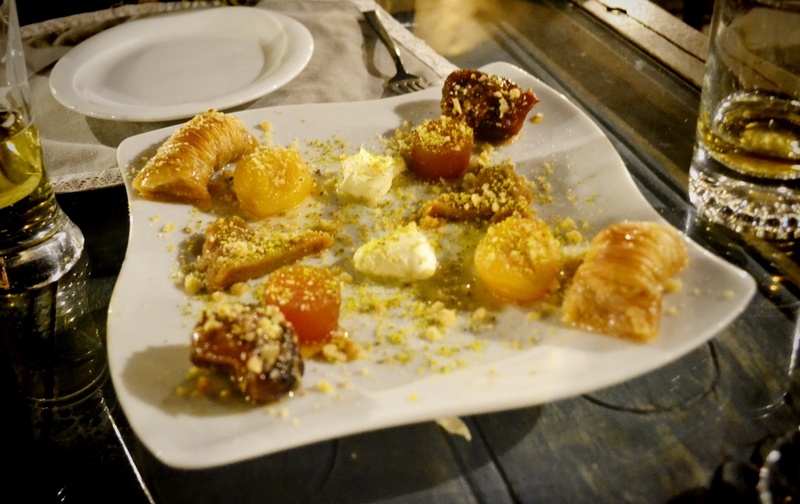 The platter of sweets included baklava, pumpkin, dates, and various nut pastries. Some of the treats were questionable. Alison didn’t like the middle one after her first bite, but once she compared the taste to Chinese moon cake filling , she quite enjoyed it! The theme of the night then became: we all need a little healthy dose of perspective! Following a satiating dinner, we took the 3 minute walk home and admired our stunning view – including a bright row of wife-beaters from the terrace across the street. 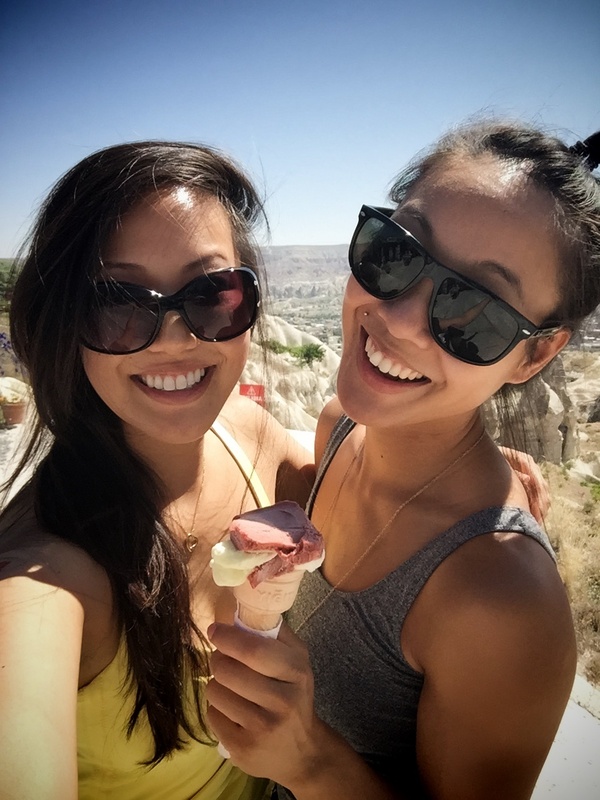 Cappadocia Day 1 was remarkable, but the best was yet to come – Birthday Hot Air Balloon Ride!! Stay tuned for my next post on the dream journey of Hot Air Ballooning in the best location in the world for it (List of top places in the world for Hot Air Ballooning here)!